We woke up this morning fully intending to go birding bright and early.. Torrential downpours meant we instead slept. We got up, had breakfast and said goodbye to Dev and Harriet. After checking out, we took the car to Rio Celeste. Rio Celeste is a river that glows a vibrant blue, due to two rivers coming together carrying different minerals which combine in a brilliant fashion. 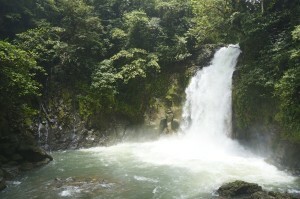 However, when we got there, the ranger told us that due to all the rain, the Rio was just a Rio, not a Rio Celeste. Sad. But we went for the hike to the waterfall anyways. 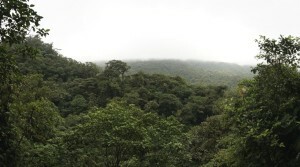 On the way to the waterfall, Kat spotted two crescent owls in a tree – a male and female pair. While Natalia was photographing the owls, Kat found a baby coatimundi with its mother. They foraged towards us, and then scurried off. They’ve recently finished a nice set of stairs down to the waterfall. It was flowing intensely, and was very water colored. On the ascent, Kat found a baby praying mantis, which resulted in much squee’ing. In spite of the words of warning from the ranger, we decided to head down the trail a bit further. It was slow going – very muddy and wet. We made it to the viewing platform, which gave us a great view of the valley. On the return walk, the rain came back, but the trees kept us mostly dry. We had a quick (but delicious) lunch at the soda near the ranger station. Next, we got in the car to head for Monteverde. The drive was slow going – lots of dirt / rock roads, with great scenery. 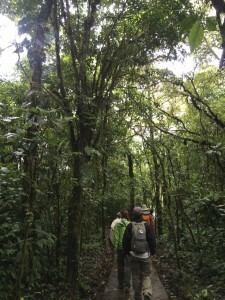 As we climbed towards Monteverde, the number of farms increased – dairy, coffee, chocolate, corn, and everything else. We checked in at our B&B, Casa Batsu and the lovely host got us some drinks and encouraged us to relax. Carlos, the host, went through his proposed menu for the evening – tortilla soup with chicken and avocado, beef with sweet potatoes and shrimp, and banana flambée. It was amazing. Now, we’re settling in for an early night’s sleep before tomorrow’s outing to San Gerardo.